We’ve looked at an array of different biofuel sources ranging from used cooking oil and algae to farm and municipal waste. This is essential as the percentage of airline emissions becomes a bigger part of our overall greenhouse gas situation. The Guardian reports, “A 2017 estimate said air travel accounted for 2.5% of all carbon dioxide emissions, with the total emissions expected to quadruple by 2050.”We’ll look here at how some of the early efforts have panned out and examine a late-breaking surprise or two. A major test, the 15-hour flight used a blended fuel 10-percent of which came from the brassica carinata, a mustard seed used as a fallow crop between regular crop cycles. Qantas’ Boeing Dreamliner 787-9 “Reduced carbon emissions by 7 percent compared with the airline’s usual flight over the same LA to Melbourne route. Compared pound for pound with jet fuel, carinata biofuel reduces emissions by 80% over the fuel’s life cycle,” according to the Guardian. Qantas has flown with biofuels since its first trials in 2012, using a 50-percent blend of used cooking oil. “Almost within a day after harvesting, they can press the oil out in their own shed and use it straight into their tractors,” he said. “Basically it’s good for growing, and also farmers can also use it. If they grow wheat every year it’s not good for the soil. They can grow mustard seed in between the wheat crops, every second or third year, press the oil and use it locally or export it for use in aviation fuel. One hectare (about 2.5 acres) of the crop can be used to produce 400 liters of aviation fuel or 1,400 liters of renewable diesel. “A lot of the biodiesel now being processed is actually from waste oil from places like fish and chip shops. A lot of these oils can be processed, but the problem is that they can’t get consistent supply. 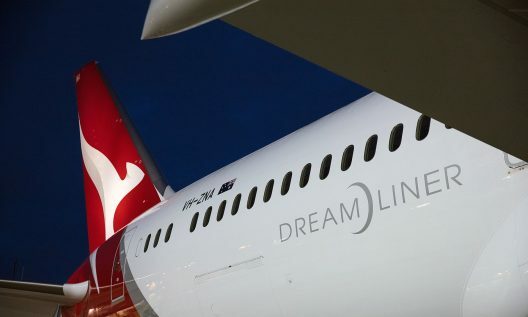 The big problem with the biodiesel industry in Australia is mainly the continuity of supply.” Qantas hopes to use biofuels, supplied by U. S. company SG Preston, on all Los Angeles-based flights by 2020. Other airlines, perhaps with less faith in the power of mustard seeds to move large jets, are using a wide array of plant and waste materials to produce jet fuel. 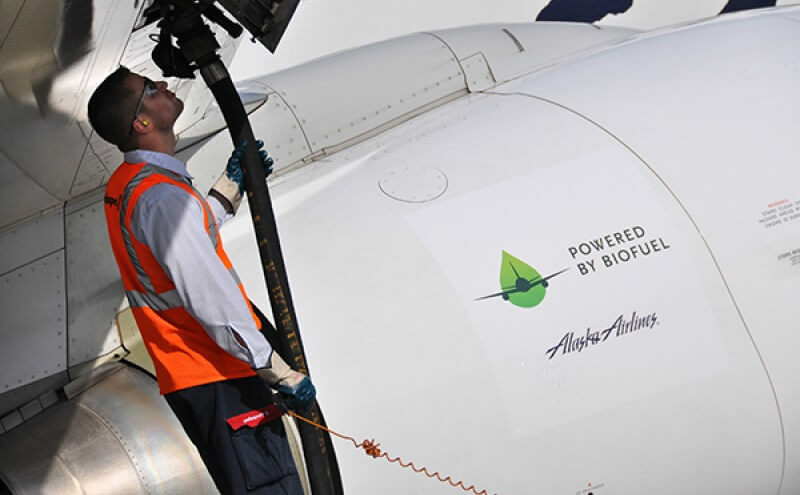 Alaska Airlines, Boeing and SeaTac Airport have been cooperating on using farm and municipal waste to produce renewable jet fuel, but Boeing’s efforts have stretched as far as the United Arab Emirates, where a plan to develop halophyte plants (which can thrive in salt water) continues with the Khalifa University. Boeing also works with partners in biofuel development on six continents, a sign of deep involvement and earnest commitment. “Alaska was the first domestic airline to fly multiple scheduled flights using aviation biofuel, and we have committed to use only aviation biofuels that meet stringent sustainability criteria.” Alaska’s 2020 goal of using sustainable aviation biofuel in at least one airport is a work in progress, with several mileposts showing the airline’s progress. In 2016, Alaska partnered with Gevo and completed three biofuel flights using fuel produced by the alcohol-to-jet (ATJ) process. They flew twice on biofuel that used corn as a feedstock, and that November, flew from Seattle to Washington, D. C. on ATJ made from post-harvest forest residues. Alaska also partnered with Boeing and the Port of Seattle to conduct a $250,000 biofuel infrastructure feasibility study, a major step towards bringing biofuels to all air carriers at Sea-Tac Airport. United became the first airline globally on SAF on an ongoing daily basis. AltAir Fuels in Los Angeles supplies fuels made from agricultural wastes and non-edible natural oils. AltAir fuels lower greenhouse gas (GHG) emissions more than 60 percent compared to petroleum-based products. AltAir’s fuels are certified for sustainability by the Roundtable for Sustainable Biomaterials. Since 2015, United partnered with Fulcrum BioEnergy, a company pioneering conversion of waste and household trash into low-cost, sustainable aviation fuel. United will have Fulcrum SAF refineries near all its U. S. hubs, producing nearly one-billion gallons in their first ten years of operation, nearly three times the amount United uses yearly. This will keep trash out of landfills, lower United’s emissions, and probably power other operation’s fuel needs. She goes on to explain that although biofuels might cut into Big Oil’s profit margins, such alternatives will not grow big enough to be a major threat to the oil business. More expensive than regular jet fuel, some biofuels price themselves out of a very competitive market. The International Air Transit Association (IATA) backs the drive to promote biofuels. Chief Executive and Managing Director Alexandre de Juniac says, “We want 1 billion passengers to have flown on a SAF (Sustainable Aviation Fuel)-blend flight by 2025. That won’t be easy to achieve. We need governments to set a framework to incentivize production of SAF and ensure it is as attractive to produce as automotive biofuels.” IATA estimates, though, that only half a billion passengers might fly on “biofueled” flights by the target date. You can see the organization’s biofuel report here. Ms. Slav explains that loan guarantees and capital grants might help if sometimes skeptical banks will cooperate. The industry hopes to trend toward carbon neutral growth and reduce net emissions. Currently, emissions average between 114 grams of CO2 per kilometer on long-haul flights and 260 grams per kilometer for shorter flights. IATA suggests biofuels could cut this by as much a 80 percent. Ms. Slav concludes that the economics will be the tricky part, with producers concentrating on reducing costs and governments providing incentives and probably regulation. Look for higher fares and greater Big Oil activity in biofuels, she cautions. With Zunum and Airbus coming forward with medium-size, medium-range single-aisle airliners, and Pipistrel and the MAHEPA organization coming forward with hybrid small aircraft, biofuels will have a promising place in near-future aviation. We have only shown a few players here, with much more to come on the national and international front in the near future.